What Are The Time Limitations For Reporting A Claim? Your failure to give notice to Pac Global Insurance Brokerage within 45 days after delivery of the shipment shall void your insurance coverage. Further, it is mandatory that you provide all supporting documents in a timely fashion, not to exceed 90 days from the date of first notice. When Should I Expect A Response To My Claim Submission? Although claim-processing times vary, depending upon factors such as geography and claim complexity, Pac Global Insurance Brokerage, Inc. is committed to providing superior service to you. Ordinarily, you can expect adjustment details within 30 days after your submission of all required documentation. Will A Professional Surveyor Be Used To Evaluate My Claim? It is within the discretion of underwriters or Pac Global Insurance Brokerage, Inc. to appoint a surveyor for evaluation of any claim. Am I Authorized To Repair or Replace Affected Items? No. You may not repair or replace an item without written authorization from the underwriters or Pac Global Insurance Brokerage, Inc. Any unauthorized replacement or repair will be entirely at your own expense. How Do I Complete My "Claim Form?" Shipping Details: Identify the exact delivery date, bill of lading number, container seal number and Declaration of Insurance number. Item Description: Identify each item you are claiming and specify the corresponding number located on the "Household Goods Descriptive Inventory." Nature of Claim: Identify whether a given item is missing or damaged. If damaged, include a detailed description. Item Identification: Identify the item's age, date of purchase, and original cost. Claim Amount: Enter the estimated cost of repair or replacement. Can Settlements Be Paid By Overseas/Domestic Wire Transfer? Yes, for a fee of US$75.00, you can opt to receive a claim payment by wire transfer. You must complete a "Wire Transfer Form" in order to formally select that option. Please request this form from your claim handler. Can Settlements Be Paid In Non-US Currency? Yes, this can be requested. It is dependent on the policy and is within the discretion of underwriters or Pac Global Insurance Brokerage, Inc.
Should your request to receive a payment in a currency other than U.S. dollars be approved, the exchange rate existing with the sending bank at the time of payment shall prevail. The insurance company does not guarantee exchange rates, which are subject to market fluctuations. A payment to you in a currency other than U.S. dollars must be by wire transfer, for which you will incur a fee of US$75.00. The Underwriters are unable to cover the cost of any charges levied by your bank for receiving or exchanging payments to another currency to finalize the deposit. How Do I Obtain Repair or Replacement Estimates? It is your sole responsibility to prove the basis of all claims for loss or damage. You must obtain repair/replacement estimates through a reliable third-party, such as a local supplier or repair facility, commercial catalog, magazine, or Internet inventory. Please be sure to include a photo of a similar or like item. Is The Inspection or Survey Fee My Responsibility? No. The insurance company will arrange for surveys if deemed necessary for the size or type of your particular claim. It will be your responsibility to pay for any inspection or survey fees that you incur without authorization from your claim handler. Submit receipts for an authorized inspection to Pac Global Insurance Brokerage, Inc., for reimbursement not to exceed US$150.00. Do the Terms & Conditions Provide Coverage For Depreciation? No. Your insurance coverage is restricted to the reasonable cost of repair. Your insurance provides no coverage for depreciation consequences. How Should I Send My Claim Documents? We highly recommend that you use an express service such as FedEx or UPS for submission of original claim documentation to us. But we will accept legible copies through alternative means, such as regular mail, fax and e-mail. Who Will Decide Whether To Repair or Replace a Particular Item? The insurance company is entitled at its sole option to replace, with any like, kind and quality, or repair any article damaged, whether wholly or in part, or to pay cash, in any event not exceeding the insured value. Is My Shipment Covered For Loss Caused By Government Action? No. You have no insurance coverage for any loss or damage to your shipment resulting from any government action, such as a customs seizure. Why is the website not responding? Please confirm you’re using the most updated version of the browser. We recommend using the following website browsers Mozilla Firefox or Google Chrome. Why is the system asking for an Inventory ID and Access Code? The system is asking for the Inventory ID and Access code because you selected the 2nd option of “Integrated Online Valued Inventory.” If you did not complete your Valued Inventory Online with Pac Global, then you should select the 1st option instead and then enter your declaration number. How do I get my declaration number? The Freight Forwarder/Moving Company has access to the declaration number. Please contact them directly as they can assist in providing the declaration number. What is a lump sum? There are several ways to insure your Household Goods with Pac Global Insurance. If shipment was insured based on weight volume/Cubic ft it’s considered a Lump Sum policy. What is a High Value list? The High value list is included in the lump sum policy which includes any item valued over the limit listed on your policy. Please review with your Freight Forwarder/Moving Company what minimums pertain to you when you completed the paperwork prior to your move. What is a Valued Inventory List? A Valued Inventory List is a detailed itemized list and value of insured items that you completed prior to your move. How can I add additional items to my claim? If you have NOT submitted your items for review. Click on the “Go back and add more damage items” link. If you HAVE submitted your items for review and need to add additional items you will need to cancel the claim and resubmit it. Log into the Octopus Portal System, click on your “Profile” on the top right of the header, Scroll down and click on “Cancel Claim” in red. How can I change the currency of the settlement? Your claim is issued in the same currency it was insured for. Click on the link at the top of the page in step 1 “Change paid out currency.” Should your request to receive a payment in a currency other than U.S. dollars be approved, the exchange rate existing with the sending bank at the time of payment shall prevail. The insurance company does not guarantee exchange rates, which are subject to market fluctuations. A payment to you in a currency other than U.S. dollars must be by wire transfer, for which you will incur a fee of US$75.00. The Underwriters are unable to cover the cost of any charges levied by your bank for receiving or exchanging payments to another currency to finalize the deposit. Why was my claim item denied for an item listed in the Valued Inventory List? 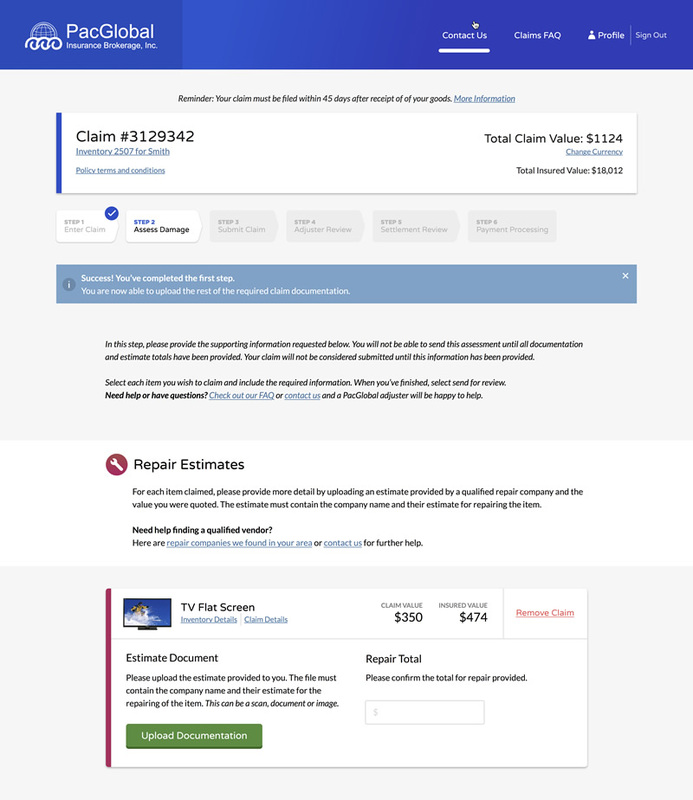 The claim item was denied due to not being found during review, help to direct where the item is located on the Valued Inventory List by selecting edit and including the additional information in the free form box for damage details. Why am I still on the “Claim Documenting” Stage? You, as the Transferee, are building a claim by adding the claimed items and photos. Unless the Freight Forwarder/Moving Company documents have already been uploaded in the Octopus Portal, our request for additional information, i.e., photos, third party estimates cannot be submitted. What does “Assess Damages” mean? You, as the Transferee have added claimed items into the Octopus Portal. You will receive notification that an action is required. If any additional information is needed, i.e. color photos, third party repair estimates and replacement estimates, you will receive a notification that an action is required. After required information is submitted and approved, the adjuster will review the claim within 48 hours. How can I get a repair company? Please locate a repair company in your area by searching on the Internet. Once a repair company is located please provide a repair quote with the inspection fee and any applicable taxes. Please note inspection fee above $150.00 needs to be approved by Pac Global Insurance Brokerage prior to the Inspection. What does “Claim Submitted” mean? Once the claim is in this step, all necessary documents have been submitted. The adjuster/underwriter are in the process of reviewing the claim. What does “Adjuster Review” mean? The adjuster is in receipt of all the documentation and a settlement offer is being prepared for your review. An email notification from The Octopus Portal will be sent to you once it is ready for your acceptance. What do I do when my claim is in “Settlement Confirmation”? Please to log into the Octopus Portal to review and approve the settlement offer. Once you have reviewed and accepted the offer, click on “I Accept this offer”. It will prompt you to provide payment reference. What do I do if I don’t agree with my offer or an item? Log into the Octopus Portal, scroll to the bottom of the page and click on the link where it states “DISPUTE OFFER.” Locate the item you want to dispute and click on “Dispute.” Upload or provide supporting documentation for the reason of your dispute and save it. Click on save dispute and “submit to adjuster for review. How do I re-submit a denied item or provide more documentation? Please review the denial reason in red to provide requested or updated information. Please then click on the “edit” link for that item to upload more color photos, documentation, and provide additional detailed information of what is being requested of the denied item. Save and click on the green button for submission and review. How does the “Payment in progress” work? Your claim is awaiting funding from the underwriters. Payment takes approximately 30-45 business days from the date you accepted your settlement offer.